The Townsend Sphere L22 is the O.G mic system that captures many of the otherwise unobtainable vintage and modern microphones in one system. The plugin has been updated to include 9 new models. We are happy to announce version 1.2 of the Sphere plug-in for native and UAD-2 systems. It’s a free update, and the big news is that it includes nine new microphone models—bringing the total count of included models over 20. 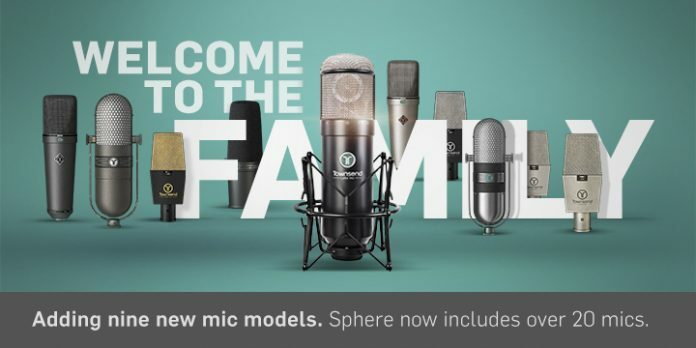 This means Sphere can be used in even more recording situations, and you get access to the sound of a mic collection worth hundreds of thousands of dollars. LD414 Brass: The original 414 with a brass-ringed CK12 capsule is one of the greatest studio mics of all time. The mic can be a fantastic choice for drum overheads, snare drum, and acoustic guitar. LD414 Nylon: In the late 1970s, AKG switched to a new capsule with a nylon mounting ring in the 414. While many people prefer the sound of the older CK12 capsule, the nylon version has a more neutral response which can work well on many sources. LD-414US: One of the most ubiquitous condenser microphones of all time. The mic uses essentially the same nylon capsule as the later production 414 EB, so the sound is quite similar although a bit more neutral. LD-414T2: Based on a newer 414 variant that was designed to recreate the sound of the old CK12 capsule but using a modern nylon style capsule. This was one of the first 414s that used a transformerless circuit. LD-67NOS: In 1991, a limited production U67 was released, made from new-old-stock parts that had been discovered. In theory, these mics are the same as the earlier versions, but in practice they sound distinctly different. LD-87TK: Based on an 87 with the famous Tracy Korby modification. The modification extends the 87’s response at both the low and high end, giving it a more modern sound but without accentuating sibilance. RB-77DX Satin: One of the most iconic microphones of all time. Countless musical legends, such as Bing Crosby, Ray Charles, Frank Sinatra, Elvis Presley, B.B. King and Johnny Cash, have been recorded with a 77. RB-77DX Umber: The 77DX is known for having a wide manufacturing variability, so some of these mics sound quite different from each other. The RB-77DX Umber model is substantially darker and smoother than the RB-77DX Satin model. DN-7: Famously used to record Michael Jackson’s vocals on the album Thriller, the DN-7 is based on a dynamic microphone which holds its own with some of the best condenser mics ever made. The model is based on the discontinued “A” version.